When the end of a color boundary is reached, the weft yarn is wound back from the boundary point. Thus, if the boundary of a field is a straight vertical line, a vertical slit forms between the two different color areas where they meet. For this reason, most kilims can be classed as "slit woven" textiles. Genuine Kilims Carpet Kilims are generally handmade woven with the slit weave technique. The slit refers to the gap left between two blocks of color. It is created by returning the weft around the last warp in a color area, and the weft of the adjacent color is later returned around the adjacent warp. Weavers pack the weft tightly to completely cover the warp and often favor diagonal patterns so as to avoid weakening the structure of the rug with vertical slits. It produces bold, sharp patterns that weavers enjoy creating with more freedom allowed than a plain weave. This is also why kilims are so closely associated with geometrical designs even though there are kilims with floral designs as well. 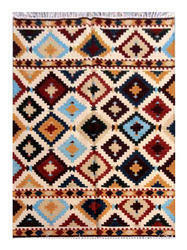 Wool is the primary and often the only material used to make a kilim rug. Many kilims are made totally from wood where it is used for both warps and wefts, and wool is the primary weft material used with cotton warps, which accounts for the great majority of all kilims. This popularity of wool is due to its inherent qualities. It is supple, durable, handles easily when spun or woven, readily takes on dyes and, most important, is in plentiful supply in kilim-making regions. There are certain breeds of sheep, like the merino, whose fleece is especially sought-after for its special luster and length of the fiber, but actually, it's the domestic fat-tailed sheep bred with it's favorable climatic and grazing conditions that provides much of the excellent fleece used in kilims. Genuine Kilims CarpetKilims are generally handmade woven with the slit weave technique. The slit refers to the gap left between two blocks of color. It is created by returning the weft around the last warp in a color area, and the weft of the adjacent color is later returned around the adjacent warp. Backed by our hard-earned experience of this industry, we are engaged in offering an exclusive range of Kilim Rugs. Our given kilim rugs are designed by our professionals keep in mind the current market trends using excellent quality material. 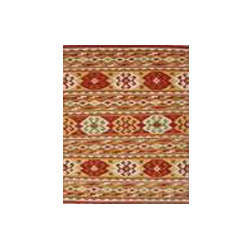 Our entire range of kilim rugs is gaining appreciation for their unmatched quality and appealing look. 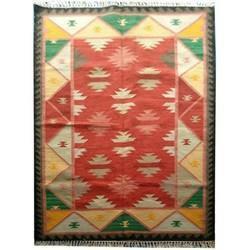 Furthermore, we provide these kilim rugs in various colors and designs to cater the wide needs of customers. 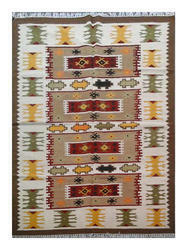 Our firm specializes in offering a supreme quality Kilim Carpets. 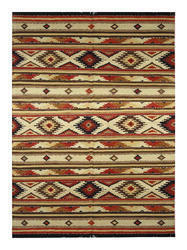 The offered kilim carpets are provided in numerous patterns, sizes colors options as per the requirements of customers. 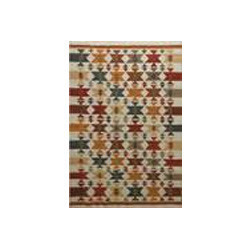 These kilim carpets are well designed using pristine quality material and progressive techniques by our talented personnel in accordance with international standard. Clients can avail these kilim carpets from us at reasonable rates.